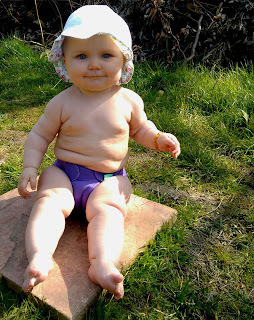 Quinn's been wearing TotsBots nappies (as well as some other brands) since she was born. Her first nappies were adorable TotsBots TeenyFits, which come in a tiny newborn size suitable for use on babies as little as 5lbs. We've always liked TotsBots nappies as a daytime nappy, mainly because I like the patterns, and also because I'm keen to support British companies, manufacturing here in Great Britain, as is the case with TotsBots, who hail from Glasgow. I have found in the past that we've had to change our TotsBots all-in-one nappies after about two hours, to ensure they don't begin to leak, particularly at the top, across the tummy, I've also had a few explosive breastfed baby poo incidents that have resulted in ruined clothes, but this hasn't been a unique problem to my TotsBots nappies and I'm pretty sure we've all been there! As a rule though, my TotsBots nappies, if changed regularly, have been perfectly satisfactory. I was really excited though when I heard that TotsBots were making a few key changes to the design of their all-in-one EasyFit design, and introducing the new and improved EasyFit Star, to replace the previous EasyFit V4. When the lovely people at TotsBots asked whether Quinn and I would like to trial the EasyFit Stars I obliviously jumped at the chance. We received five nappies, which would typically last us Quinn's waking daytime hours. Three of these were in block colours; Sweet Pea (green), Sugar Plum (purple) and Pumpkin (orange), and two designs from TotBot's Elementals range; Twinkle (moons and shooting stars) and Tweet (song birds). 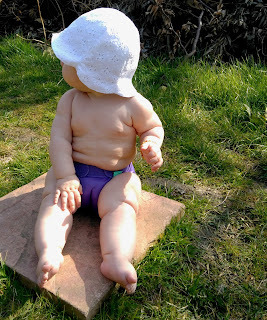 As I'd used EasyFits in the past, I was really comparing the new Star nappies to their predecessor, and couldn't really treat them as a brand new product, as someone who was new to the brand might be able to, so let's look at what's changed. Stitch Free Seams - The cuffs and edges of the nappy are no longer externally stitched, which means that the nappy sits snugger to the skin, and no gaps are created by stitched edges. I wasn't convinced that this would make that much of a difference, however we had no edge leaks at all from the nappies all day. Buffer Zones - The nappies now feature leak-proof buffer zones, including a larger leak-resistant panel across the waist band (where I'd previously experienced the most leaks from my TotsBots nappies.) This has made the world of difference. Even with Quinn taking a nap, and laying partially on her front, or spending time in her carrier where her tummy is pressed against mine - we had absolutely no leaks, and no irritation to her skin either. Bamboo Core - The EasyFit nappy now features a super absorbent bamboo core. I love bamboo as an absorbent nappy material. 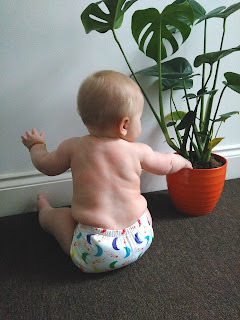 I've previously raved about the performance of bamboo nappies, as it's such a thirsty fabric. Quinn wears bamboo overnight as it's so absorbent, and I'm really glad to see TotsBots embracing the bamboo too! It's made an absolute difference to the performance of the TotsBots EasyFit. These are now an incredibly absorbent nappy. Gone are the days of two hour changes. I put an EasyFit Star on Quinn as a night nappy - as an experiment really, though I totally expected leaks - nothing, from a ten hour wear! I would never get away with this with an unboosted V4. These will now probably become my most-recommended nappy. I'd previously encouraged people to opt for Little Lamb bamboo nappies with Little Lamb bombproof wraps - and I'd still stand by that system as a really reliable and high performance nappy. But the problem with the Little Lamb nappies is that they're so so bulky. I know a lot of people only use them at night for that reason. They're huge on the bum, and I'd had to pretty much give up putting Quinn in trousers because her bottom was so big! 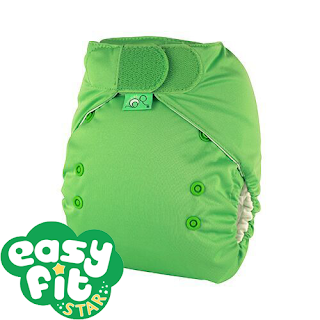 The EasyFit Star however, performs on exactly the same level, offering the same level of absorbency, and leak proof-ness, without the bulk. Quinn's still got that puffier, more rounded bottom thanks to her nappy, so I'd still opt for as much "cut for cloth" clothing as possible, but at least leggings are an option again! I love the designs available, and whilst I haven't seen them 'in the flesh' yet, it's great to see TotsBots releasing some new patterns with their brand new range of Story Time prints, but the block colours still look really great - and I'll always stay true to the Elementals range, because Twinkle has always been one of my favourite nappy designs! If you'd like to see some more photos of Quinn in her EasyFit nappies and to see our day in EasyFit Stars in pictures - simply search for #EasterWithTotsBots on Instagram! TotsBots Easyfit Stars retail for £16.99 per patterned nappy, and £15.99 for the block colours, but can also be bought in packs at better value. Why do breastfed babies need vitamin supplements? Can Feminism Exist without Veganism?